I got intrigued by Julia Gfrörer‘s work last year, when I picked her book Flesh and Bone at San Francisco’s Alternative Press Expo. Published by Sparkplug Comic Books in 2010, it is a macabre, mature-readers-only story about a charismatic devil-worshipping witch. I was impressed by the Portland-based artist’s talent for dynamic storytelling, as well as her ability to create smart dialogue. 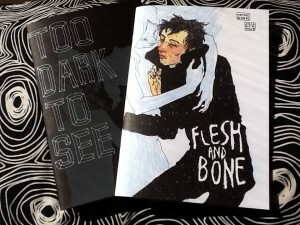 But what I liked the most about Flesh and Bones are the unobvious plot turns and the unrelenting darkness of the tale. When I saw Gfrörer’s 2011 book Too Dark to See on Sparkplug’s table at this year’s APE, I immediately grabbed it. The plot revolves around a young couple whose life gets disturbed by mysterious (and very horny!) forces. But what’s most powerful in the story is not the fantastical, but the realism. The characters in Too Dark to See are stereotypical American 20-somethings: she works in a coffee shop, he seems to be a freelance writer. Everything about them–from the way they talk to the mess in their bedroom–is eminently lifelike. The artist captures the crushing malaise of their life, with the sad grind of mundane jobs and “on-demand creativity,” and uncertainty in both work and love. The unease that looms above them is exacerbated by Gfrörer’s style. Just like in Flesh and Bone, the characters look sickly; the panels are drawn in thin, anxious strokes. But the style is also mischievous: sharp, but with a bit of looseness and doodliness to it, as if the lines could run in unexpected directions any moment. It is important to note that the tricksters who intrude into the lovers’ life do not have sharp contours. It is as if they come from a more primordial, more chaotic place, where even the difference between figure and ground is not established. In Julia Gfrörer’s tales, the boundaries are muddled, that is, there is no “good vs evil” struggle. Both stories have their innocents and deviants, but instead of making them fight, the artist puts them in situations that are nothing other than morbidly ridiculous. The only issue I have with Too Dark to See is that it feels not quite finished. It would be interesting to know if the encounter with the “dark forces” was actually liberating for the characters in any way. There is actually a tradition of storytellers thematizing the liberating power of strange events–Japanese movie director Shinya Tsukamoto (of cyberpunk classic Tetsuo) comes to mind. But if the artist decides to choose ambiguity instead, it is of course her inalienable right. Too Dark to See was published by Thuban Press, which very recently put out a new comic by Gfrörer, Black is the Color Part 1. The books are available through the artist’s webstore. 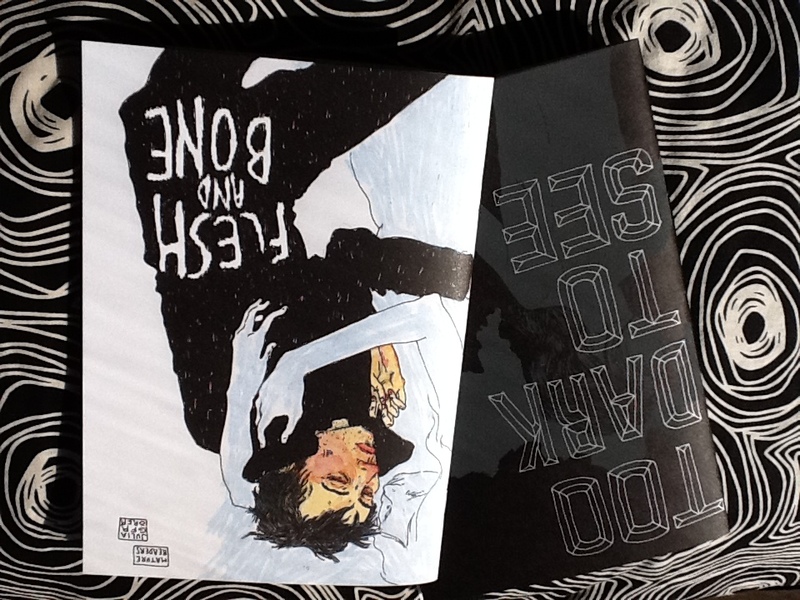 This entry was posted in Columns and tagged Flesh and Bone, horror comic books, indie comic books, Julia Gfrörer, julia glosemeyer, San Francisco, sparkplug comics, tetsuo, the alternative press expo, thuban press, Too Dark to See. Bookmark the permalink. Follow any comments here with the RSS feed for this post. Post a comment or leave a trackback: Trackback URL.